In a first, the US space agency has directly observed fundamental process of nature after sending four spacecraft through an invisible whirlpool in space called magnetic reconnection, like sending sensors up into a hurricane. The findings showed that magnetic reconnection is dominated by the physics of electrons – thus providing crucial information about what powers this fundamental process in nature. Magnetic reconnection is one of the prime drivers of space radiation and a key factor in the quest to learn more about our space environment and protect our spacecraft and astronauts. The effects of this sudden release of particles and energy – such as giant eruptions on the sun or radiation storms in near-Earth space – have been observed throughout the solar system and beyond. “We developed a mission called the Magnetospheric Multiscale mission (MMS) that for the first time would have the precision needed to gather observations in the heart of magnetic reconnection,” said Jim Burch, principal investigator at the Southwest Research Institute in San Antonio, Texas. “We received results faster than we could have expected. By seeing magnetic reconnection in action, we have observed one of the fundamental forces of nature,” he added. MMS is made of four identical spacecraft that were launched in March 2015. They fly in a pyramid formation to create a full 3D map of any phenomena they observe. On October 16, 2015, the spacecraft travelled straight through a magnetic reconnection event at the boundary where Earth’s magnetic field bumps up against the sun’s magnetic field. In only a few seconds, the 25 sensors on each of the spacecraft collected thousands of observations. “One of the mysteries of magnetic reconnection is why it’s explosive in some cases, steady in others, and in some cases, magnetic reconnection doesn’t occur at all,” noted Tom Moore, mission scientist for MMS at Nasa’s Goddard Space Flight Centre in Greenbelt, Maryland. At the edges of Earth’s magnetic environment – the magnetosphere – such events allow solar radiation to enter near-Earth space. With this new set of observations, MMS tracked what happens to electrons during magnetic reconnection. 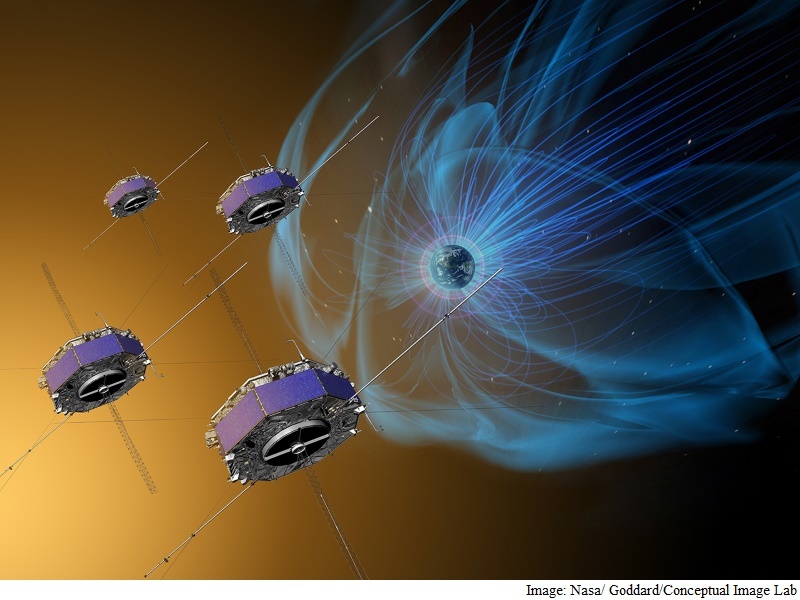 As the four spacecraft flew across the magnetosphere’s boundary, they flew directly through what’s called the dissipation region where magnetic reconnection occurred. The observations showed the electrons shot away in straight lines from the original event at hundreds of miles per second, crossing the magnetic boundaries that would normally deflect them. Once across the boundary, the particles curved back around in response to the new magnetic fields they encountered, making a U-turn. By watching these electrons, MMS made the first observation of the predicted breaking and interconnection of magnetic fields in space. “The data showed the entire process of magnetic reconnection to be fairly orderly and elegant,” said Michael Hesse, space scientist at Goddard, in a paper published in the journal Science. There does not seem to be much turbulence present, or at least not enough to disrupt or complicate the process. This suggests that it is the physics of electrons that is at the heart of understanding how magnetic field lines accelerate the particles. Since its launch, MMS has made more than 4,000 trips through the magnetic boundaries around Earth, each time gathering information about the way the magnetic fields and particles move. No Comments on "Magnetic Reconnection Directly Observed for First Time"